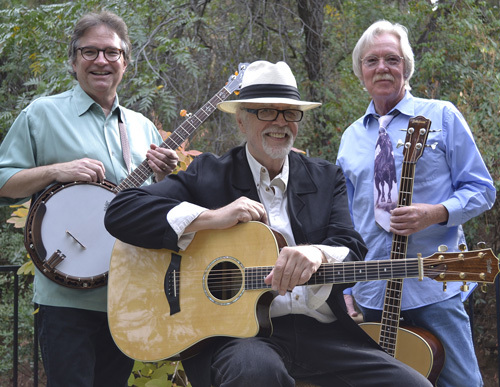 CRARY, EVANS & SPURGIN entertain audiences with new songs and old stories, blazing instrumental artistry, and deep- down, powerfully felt musical moments. It’s whistling winds in the pines, rambling boys and tragic girls, joys and laughter from old times, furious and foot-tapping instrumental tunes and a little touch of glory-to-god. And it’s the hovering ghosts of Jimmie Rogers and The Carter Family and Bill and Lester and Earl and Woodie and all the greats who showed the way. DAN CRARY is a musical legend, master of the guitar, a founder and pioneer of flatpicking, and a stylist with an international reputation for innovation, taste, and brilliance. A veteran of tours in more than thirty countries, today Dan draws from traditional material and continues to blaze new territory in his recordings and personal appearances. If creativity, quality, and longevity are hallmarks of artistic achievement, then Dan Crary must be recognized as one of the greatest traditional artists of our day. BILL EVANS is an internationally known five-string banjo life force. Bill’s electrifying performances spring out of his deep knowledge, intense virtuosity and contagious passion to all things banjo. In a career spanning decades Bill is loved by thousands of fans worldwide, due to his international performing, authorship of Banjo For Dummies, the world’s most read book on the instrument, and many remarkable personal appearances, including the San Francisco Symphony and A Prairie Home Companion with Garrison Keillor. Bill Evans’ 2012 CD In Good Company topped international folk and bluegrass charts. STEVE SPURGIN is a native son of the Lone Star State whose song writing, recording, and performing have spanned the globe. As a former Nashville staff writer Steve penned hit songs for the publishing companies of Gene Watson and Reba McEntire. Today, Steve the performer is the essential singer-songwriter, entertaining audiences and winning major awards from BMI and IBMA; recently he won the “New Folk” award at the prestigious Kerrville Folk Festival. His “performed with” resume’ includes, among others, the super group California, Byron Berline and Sundance, Mason Williams, Freddy Fender, and The Limelighters.